Displaying entries 1 to 3 of 3 in this listing. 2 colour, 2 sided, A5 Leaflet. 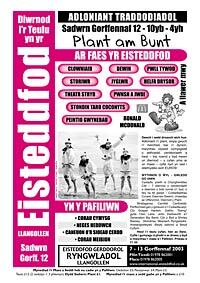 Produced in Welsh and English for the International Eisteddfod in Llangollen. This leaflet is an example of budget printing and design suitable for distribution through regional newspaper insert. We designed our own leaflet to promote this website. The leaflet was designed to be quick and easy to read. The images used were collected by going through over 5GB of colour printing files. Each thumbnail represents a job designed and produced by A5 Publications. It was printed in full colour bleed on 170gsm stock so it would stand out even more. If you would like a leaflet that stands out, get in touch. Tel: 01490 430667. This leaflet was designed and printed by A5 Publications. It's accompanying website was designed by A5 Internet. 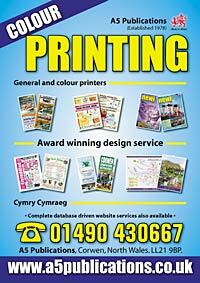 The leaflet is a 3 panel full colour bleed DL 2 fold leaflet suitable for placement in Tourist Information offices.